How Do We Remember The Waco Seige of 1993? 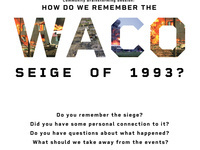 Join the Deaprtment of English for a community brainstorming session on the Waco Seige of 1993. Four special sections of English Composition are looking for community input for their spring research projects. An 8 minute documentary will be shown at 10am and 11am in the Community Room of the Huntsville Public Library. This event is free and open to the public. Questions, email Professor Michael Demson, demson@shsu.edu.